Webster County has applied for and achieved Agri-Ready County Designation by Missouri Farmers Care (MFC). This designation recognizes counties willing to partner in actively supporting Missouri agriculture and enhancing the agriculture industry at its roots. Through the Agri-Ready County Designation, MFC will work with county leaders, farmers and agribusinesses to advance local agricultural enterprises and enhance workforce readiness for agricultural careers. The collaboration will include promotion of the Missouri Department of Agriculture’s Agricultural Stewardship Assurance Program recognizing stewardship at the farm level. To advance agriculture literacy at elementary ages, MFC will seek local 4-H and FFA leaders to implement the Agriculture Education on the Move program in Webster County third grade classrooms. Webster County’s farmers and ranchers sold over $76 million in market value of agricultural products in 2012 from 1,837 farms, according to the United States Department of Agriculture’s (USDA) most recent agricultural census. Ninety two percent of the value is derived from livestock sales as the county ranks in the top ten statewide for raising cattle and calves, milk from cows and pullets for laying flock replacement and first in the country for rabbit production. The county is a leading producer of feed products including sorghum for silage, forage land used for all hay and corn for silage. 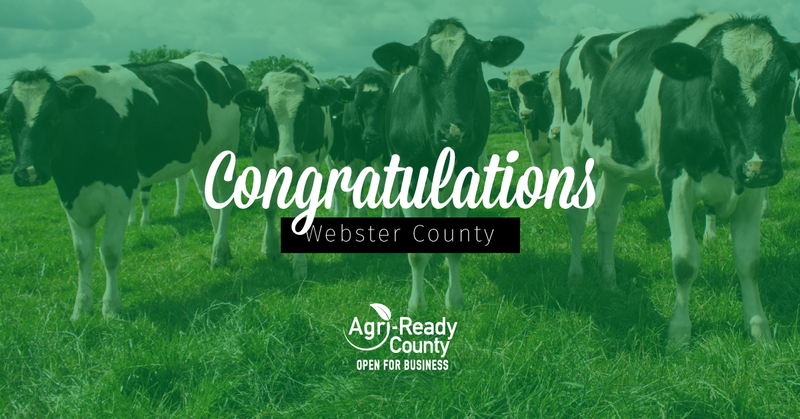 Webster County joins Audrain, Carroll, Cooper, Chariton, Dallas, Cole and Pike counties in achieving Agri-Ready designation. Counties wishing to apply for the Agri-Ready designation must meet program requirements, including no ordinances regulating agriculture more stringent than state law and support of agricultural stewardship, growth and opportunities. After application is received from the county commission, the Missouri Farmers Care Agri-Ready Review Committee examines local ordinances, regulations, and statements of support prior to awarding Agri-Ready designation.